Israel politics are in for a major shakeup. New faces will dominate the next cabinet under Binyamin Netanyahu, while 52 of the 19th Knesset members are new and more youthful faces. Prime Minister Binyamin Netanyahu is pondering keeping responsibility for defense while naming Yair Shamir (No. 2 in Likud’s partner Israeli Beitenu) minister for running the defense ministry, debkafile discloses. This would upset outgoing Vice Prime Minister Moshe Yaalon’s expectation of defense in the post-election Netanyahu government. Since the results of Israel’s general election of Tuesday, Jan. 22, were out, Netanyahu (whose Likud-Beitenu garnered only 31 seats) has been locked in intensive negotiations with Yair Lapid, whose party came second with a stunning 19 seats, on the shape of the next government. They have also discussed inviting retired defense minister Ehud Barak to stay on as a non-political expert. For now, debkafile reports, Lapid who is in a position to pick and choose the cabinet post he wants, has turned down the post of finance minister for himself, while admitting to his friends that he wouldn’t say no to the foreign ministry. Upon hearing this, ex-Foreign Minister Avigdor Lieberman, said cynically Wednesday that the finance ministry was right down Lapid’s street in view of the strong social and economic agenda to which he committed his Future party. His party might resent his abdication of those goals, Lieberman commented. Wednesday night, Lapid himself put paid to a chorus led by Labor’s Shelley Yacimovitch for his Future to join the left-of-center and the Arab parties to block Netanyahu’s efforts to build a coalition government. Instead, he welcomed Binyamin Netanyahu as next prime minister. “I was glad to hear Netanyahu referring to all the things I have been aiming for,” he said to reporters. 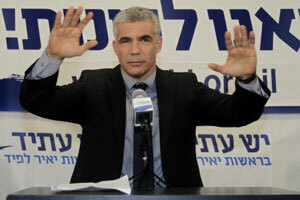 There will be no opposition bloc – certainly not with Hanan Zouabi,” said Lapid. Netanyahu, speaking after the elections, spoke favorably of some of the objectives Lapid’s Future had set itself: Starting with averting the Iranian nuclear threat, he went on to speak of equalizing the burden between the secular and ultra-religious communities, bringing down prices, providing affordable housing and reforming the system of government. Lapid refrained from answering when he was asked whether he would serve in the same cabinet as the ultra-religious Shas party (11 seats), which is a longstanding coalition partner of Likud and with which Netanyahu conducted separate negotiations Wednesday. This dual track opened up the possibility of establishing a government led by Netanyahu and Lapid in two stages: In the first, this duo would be joined by the pro-settlement Jewish Home and its head, the high-tech millionaire Naftali Bennett (11) and Kadima led by Shaul Mofaz, which Wednesday night was poised to scrape past the threshold with two seats. This setup would command a slim majority of 63, enough to get the 2013-2014 state budget passed by the new Knesset. This task defeated the outgoing government because some of its provisions were unacceptable to Shas and so triggered the early election. Bennet expects his Jewish Home party to win a twelfth seat when the army ballots are counted before official election results are released Thursday. He would be strongly in line for one of the economic portfolios in the new government, commerce and industry, for instance, or even finance. Tzipi Livni, whose Hatenuah Party fell far short of her expectations and wound up with 6 seats, has been after Lapid to set up a joint front for the cabinet negotiations with Netanyahu. She anticipates his gaining the post of acting or vice prime minister plus a key cabinet post. She would then walk through the door to her former post as foreign minister, or so she hopes. The Future party leader and the incoming prime minister have not commented on this plan.